No commercial property is complete without push bars available in case of emergencies. Don’t put your business at risk, let your local team of pros take care of everything! We offer a full range of commercial locksmithing services. For example, we can install, maintain and repair push bars for your place of business. 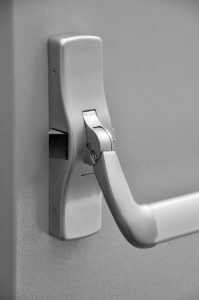 Also known as “panic bars”, “crash bars” or even “panic devices”, this technology (resembling a door handle) offers an easily-accessed mechanism enabling a rapid exit from a locked room or building during an emergency. Today, building codes usually require institutions and businesses serving the public to install push bars for safety reasons. In fact, next time you are in an office building or go to see a concert at the Arena Theatre, check out what style of push bars are at each location. Essentially, a panic bar can help save lives in some situations. A locksmith affixes a spring-loaded metal bar along the interior of a door (or double doors) opening in an outward direction. The occupants of the building can exit rapidly during an emergency simply by depressing or pushing the bar against the door, an action which releases the door locking mechanism quickly. Laws requiring this type of fast emergency exit mechanism first came into widespread use after a terrible tragedy occurred in Victorian England. It caused planning officials to recognize the need to require exits for crowds in public buildings. When crowds of people fill a building, it may become essential to offer a quick way for everyone to exit the premises. We offer comprehensive locksmithing skills, including a full range of commercial and emergency locksmith services. Whether your business requires the production of additional office keys, the replacement of high-security hotel door locks, the installation of new commercial security systems or the repair of malfunctioning panic bars, you can depend on us for assistance at any time. Dependable, fast response times, and more! Our team responds to requests for locksmithing services at any hour of the day or night, making us your most reliable choice for an emergency locksmith. Or, we’ll schedule commercial assignments at your convenience, to prevent the disruption of your business operations. Consider contacting us whenever your firm seeks locksmith services in Houston. We offer a full range of services for your business. We can help you remain in compliance with building and safety codes by installing or repairing panic bars! Call us now to schedule your next locksmithing appointment.